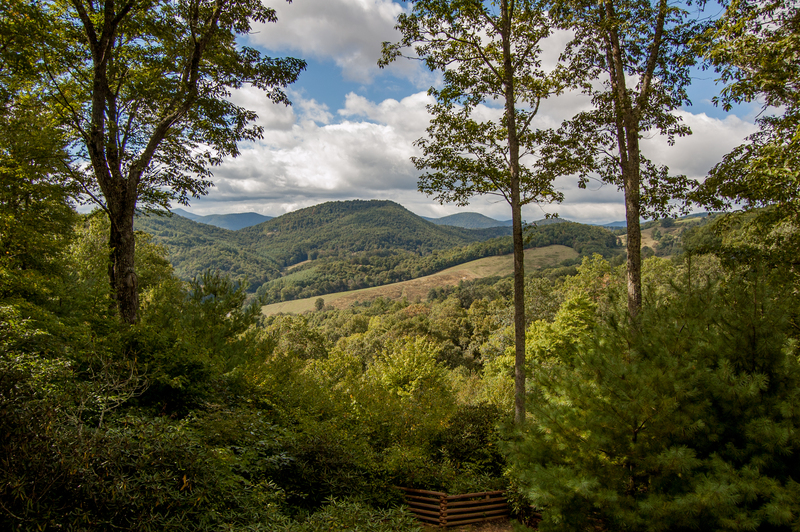 Long Range Layered Mountain Views From the Porch of Ridge Top Retreat! 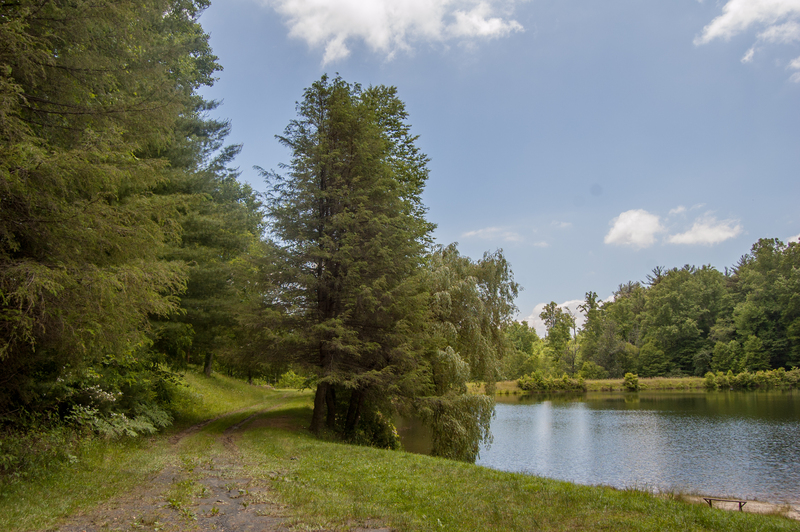 Located Off Scenic Railroad Grade Rd. Perfect 10 mile stretch for bicycling along the New River, Fishing, Inner Tubing, Swimming and More! 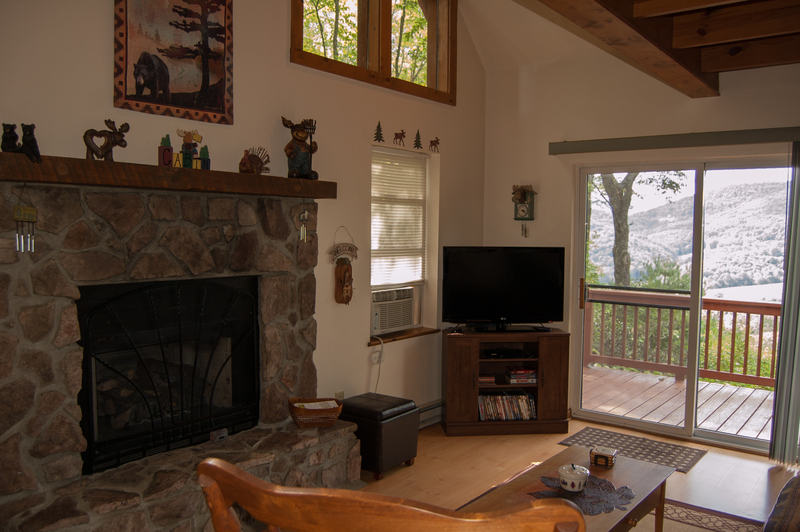 Great room with Gas Burning Fireplace, Flat Screen TV, Views from the Sliding Glass Doors and Access to the Open Deck. Deck with picnic table and gas grill. 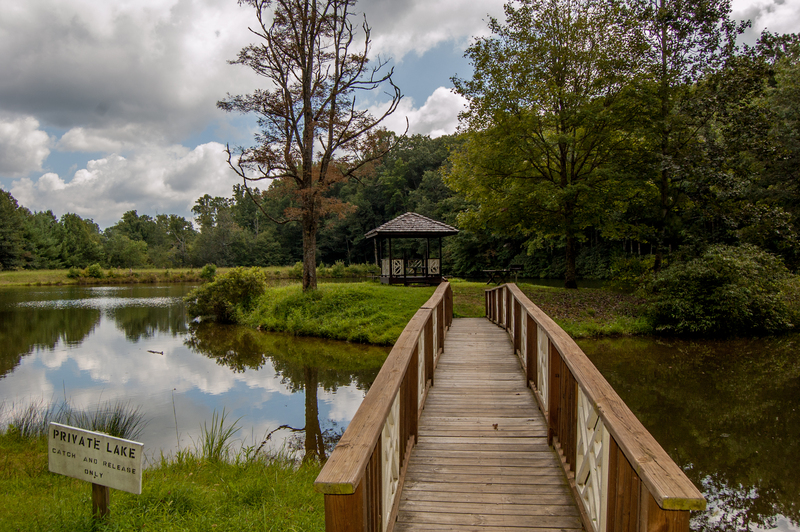 Common Area Pond with Walking Trail. Just minutes from Ridgetop Retreat. Lots of Place to Lounge. 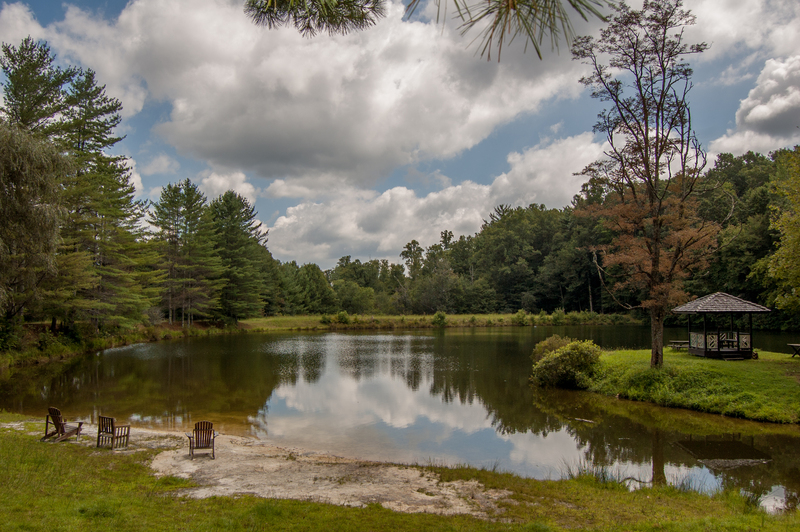 Easy Access for Fishing, Swimming, Tubing and Kayaking. 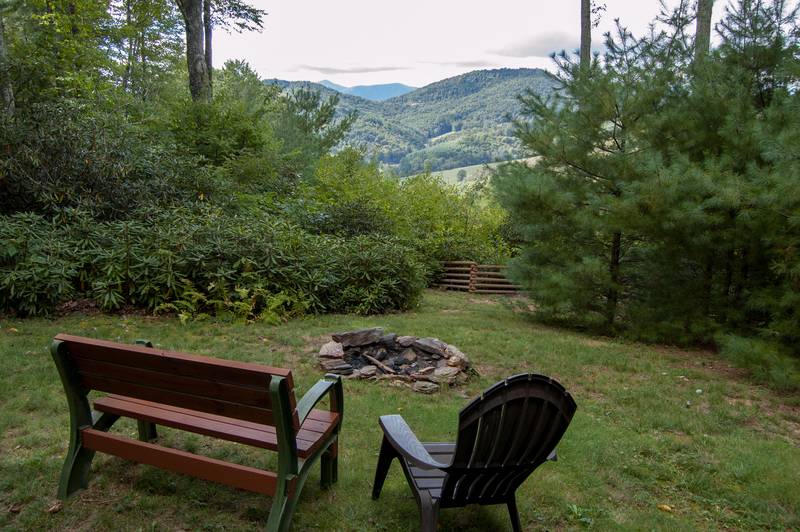 The gorgeous view greets you as you enter the Ridgetop Retreat Cabin and look out the big picture windows, and as you relax on the deck furniture, perhaps enjoying the quiet of the mountains, a sunset over the mountain peaks, a relaxing beverage, or dinner with family or friends. 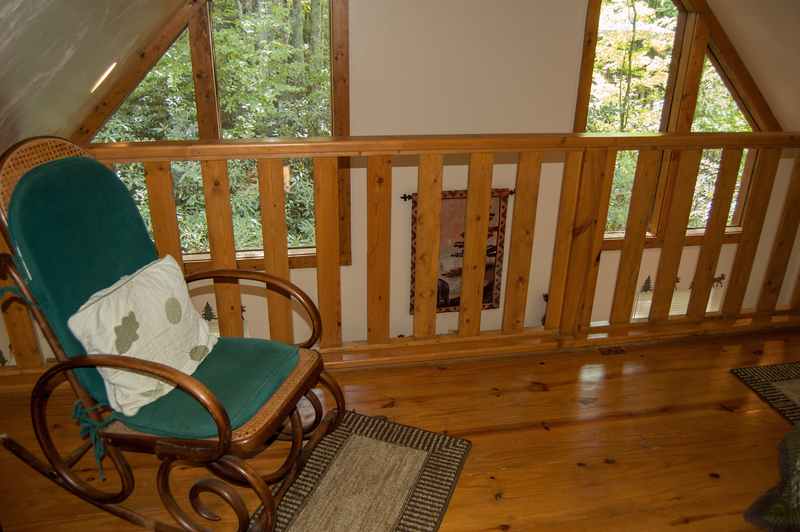 After waking to the mountain view out the master bedroom window, enjoy your first cup of coffee and the sweet-smelling morning air on the scenic deck or on the rocking chair front porch. The cabin is decorated in tasteful mountain decor. It combines the best features of a private, cozy get-away and the modern conveniences to which we have become accustomed. The cabin features a complete kitchen with stove, microwave, dishwasher, refrigerator, coffeemaker, toaster, and all the other amenities of your kitchen at home. We provide all paper products (paper towels, toilet paper, napkins, kleenex), soap, shampoo, coffee filters, detergents, plastic wrap and aluminum foil, salt, pepper, basic spices, and, yes, even night lights. 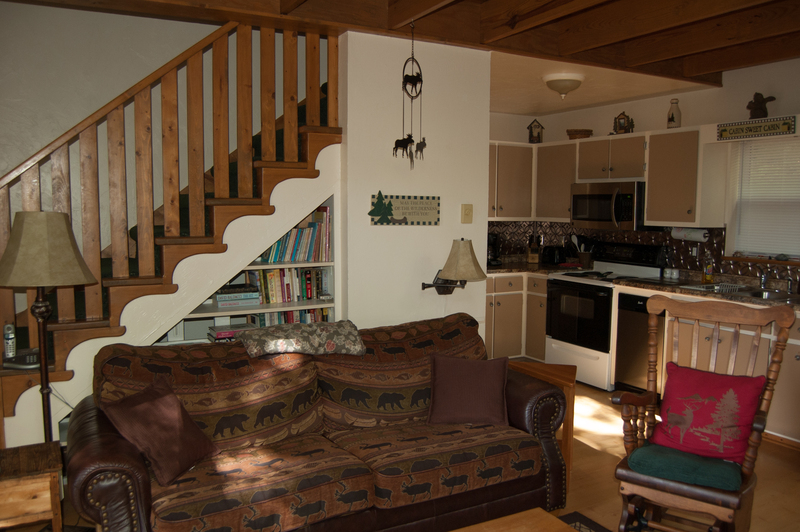 The living area features a flat screen TV, DVD/CD player, high-speed internet, DVDs, books, games, a small selection of CDs, and binoculars for getting close-up views of the trees, plants, and animals in our awesome view. The back deck has a gas grill, picnic table, rocking chairs, and a bench for taking in the wonderful view and mountain air. The front deck also has an eating table and chairs. The master bedroom has a high-quality memory foam mattress and fluffy comforter (in season), and the loft has two sleeping areas, one with a queen-size bed with a pillowtop mattress and the other with a twin bed. We provide all linens. There is a full bathroom downstairs and a half bathroom upstairs. At 3500 feet, the Ridgetop Retreat cabin sits at the top of a scenic ridge with an awesome view into the valley below and to the mountains on the other side of the valley. 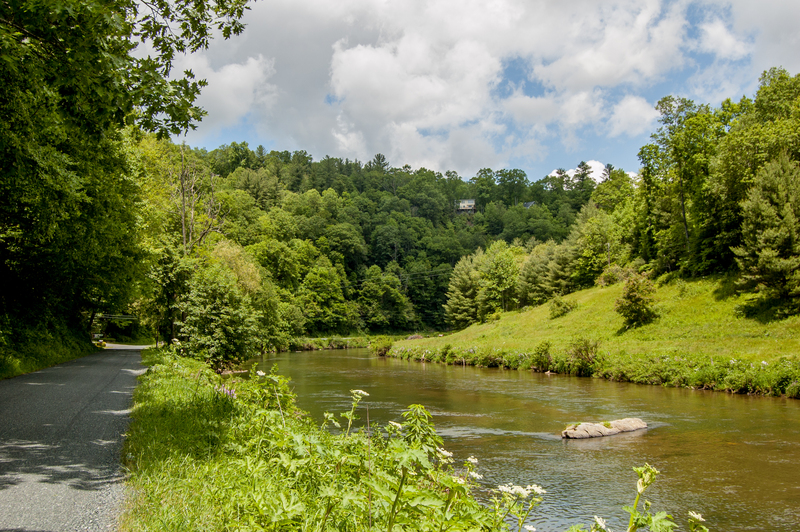 Even though the cabin is on a ridgetop, it is only a mile to the bottom of the mountain and the historic New River with its access to fishing, kayaking, tubing, and wading (for our Spring, Summer, & Fall guests). 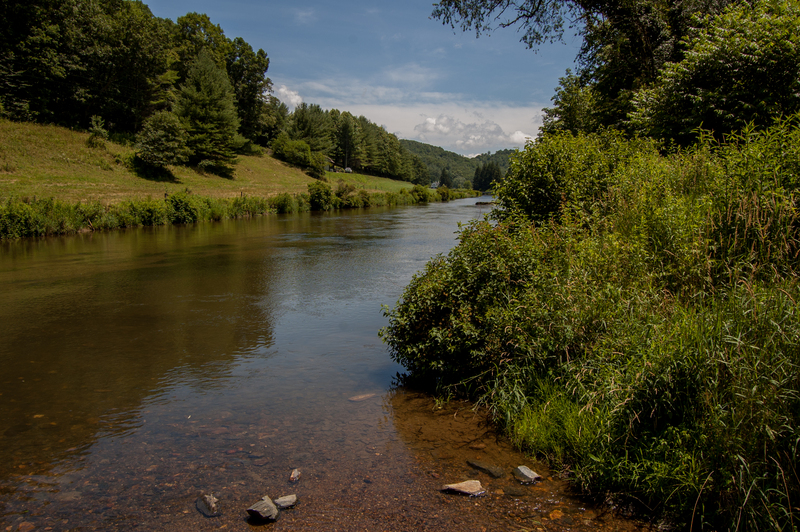 If you journey down our mountain, you run right into an especially scenic part of the New River, where you can tube, kayak, fish, and even wade. 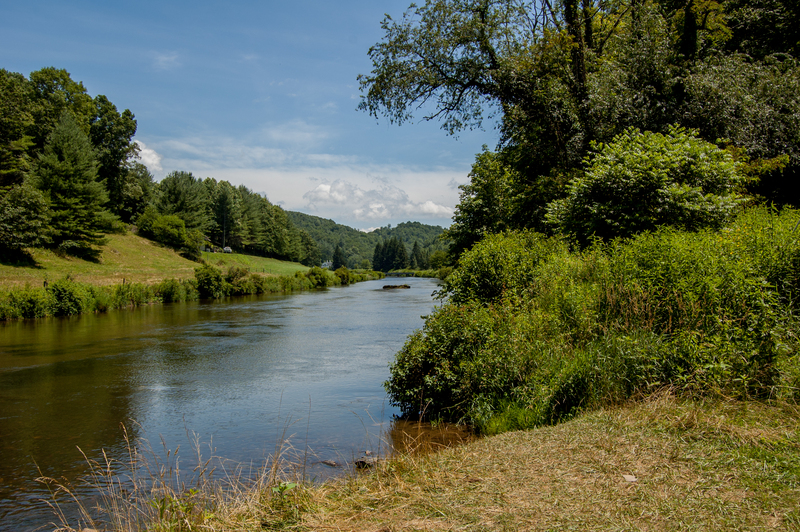 The narrow paved road that runs along the river has been voted as one of the best bicycling routes in North Carolina - completely flat, but with scenic mountains, pastoral views, and the sun shimmering off the river and a cool mountain breeze to please your senses. Bicycle to nearby Todd and visit the historic General Store or rent kayaks, tubes, and bicycles at a nearby outfitter (in season). 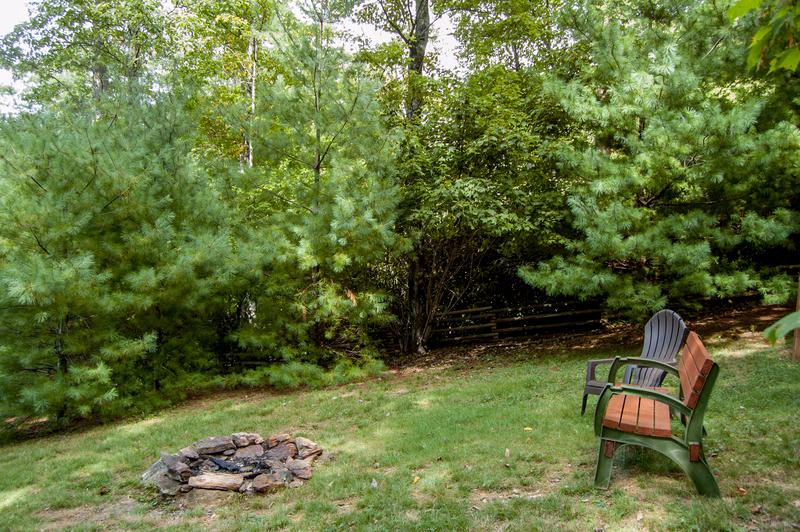 In the evening, sit around the cozy fireplace drinking hot chocolate or make a fire in our back yard fire pit, roast marshmallows, and enjoy your favorite beverage. 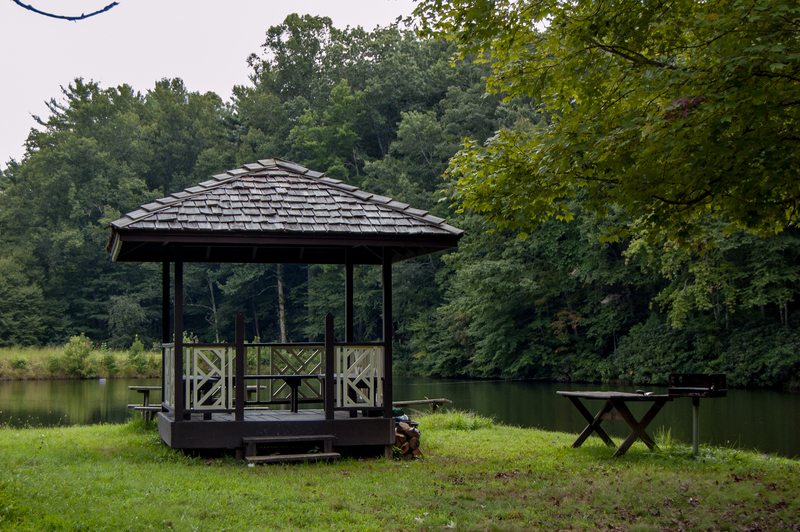 Our mountain resort community also includes a small lake with a quiet swimming beach and an accessible island in the lake with a gazebo picnic area. For golfers, the Mountain Aire and Boone Golf Club courses are only a few miles away. 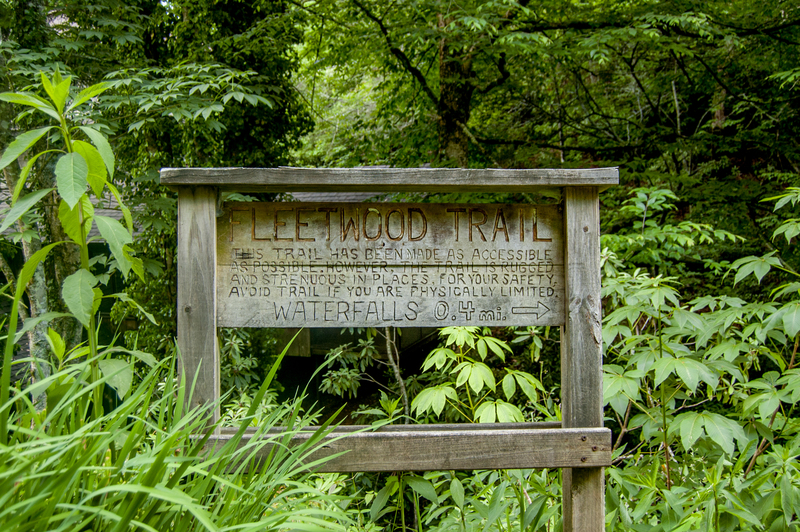 If you prefer hiking, there are several nice walks and hikes within the resort community, including one to a waterfall (Fleetwood Falls), and there are numerous hiking trails off the nearby Blue Ridge Parkway. 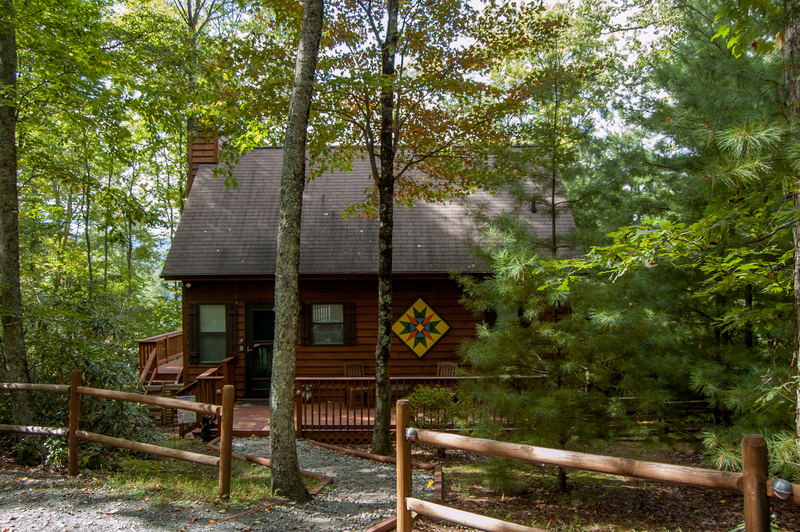 The cabin is conveniently located within a short drive of the Blue Ridge Parkway, Boone, Blowing Rock, Todd, the Jeffersons, and several major ski resort areas. "The roads were clear of show, the porch was not. Other than that the place was beautiful, cozy and I would highly recommend it to anyone looking for a quiet trip with a beautiful view. We were lucky enough the last day the weather cleared to for us to see the view! I hope to be back!!! Did have to replace the battery on the Co2 alarm, no biggy though. Rental agency was super nice and easy to work with as well. Just a 30 minute drive to town which wasn't bad at all! Beautiful country drive! " "The Ridgetop Retreat was amazing. The view was breathtaking. From the moment my husband and I drove up, we could feel the peace, love, and contentment surrounding the place. The house was clean and spacious, yet cozy enough for two. We will defiantly be going back to this wonderful place!" "We had a lovely and relaxing stay even though the gas logs did not work (were informed the Monday before our weekend stay but was given 15% rent compensation). Owner had changed TV streaming and we had to call rental agency to get information because instructions were incorrect. If in the area again, we would stay at this cozy cabin. Thanks for making our anniversary memorable." "Could not find a thing to dislike about this cabin. The view was unreal!! Just the right size for the two of us with room to spare. Would be a great size for a family get away with our two children. Will definitely have to go again. " "We had a great weekend at Ridgetop Retreat! It's quite a drive up to the top, but the view is your reward. Cabin was well-equipped with comfy beds, clean bathrooms, and well stocked kitchen. We ate in W. Jefferson one night and Boone the next. Biked to Todd for amazing fresh cinnamon rolls! Trail at the bottom of the hill was overgrown, so we opted to skip the hike. Thanks for a wonderful stay!" "We stayed for a few days and enjoyed every minute of it!! Close to the New River for tubing and fishing trips. Not far from West Jefferson so stores and restaurants are easy to access "
" Loved the property and location. A very nice clean cabin with everything you needed and more. The view was spectacular and the location was close to everything. Our was the perfect size for our family of five and i loved the river being so close. Will definitely stay again. Thank you . You made everything very easy. " "The sunset is amazing. " 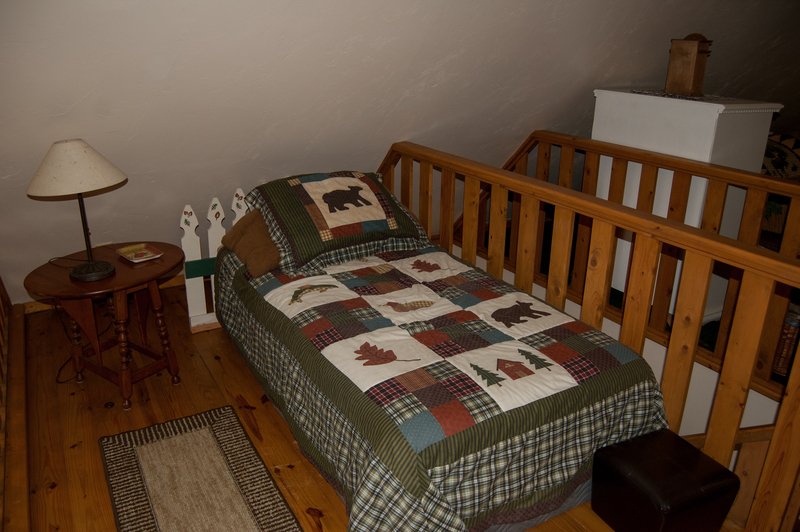 "we loved our stay very much,the little cabin was great and so was the view"
"This is a perfect cozy cabin! The view is amazing! We loved our stay and cant wait to come back." " We had a wonderful stay. 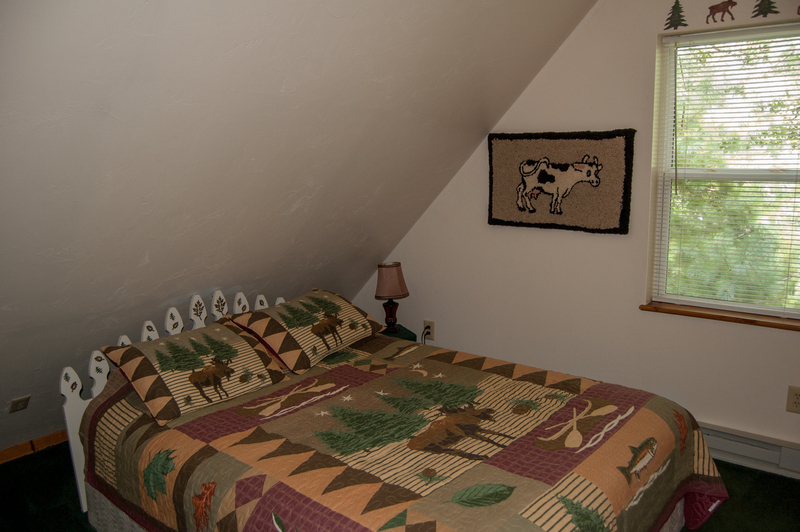 The description of the property was accurate and the cabin was clean and well-maintained. The management company provided excellent customer service. I would definitely recommend this to couples or families. This cabin is very kid-friendly with games, books and movies provided. We went to The Blowing Rock (we have stayed in Blowing Rock before but never visited the actual rock. We also visited West Jefferson, which was our favorite and not far away. We thought there were some falls to see but we never found them. We would definitely recommend this cabin and plan to go there again ourselves. " "The place was exactly as described. It was a great size for me, my husband, and my two children (5 and 7). They loved sleeping in the loft. The outside was nice and well kept. We enjoyed the view and the fire pit, as well at the deck. The bed in the main bedroom had a dip in the middle which made it a bit uncomfortable to sleep in." "Couldn't figure out the TV. Would like to have had some local channels." "We had such a great time at Ridgetop Retreat! The cabin is on the smaller side, but it is adorable and neat as a pin! I was very impressed with the cleanliness - there weren't even any cobwebs outside! The beds were comfortable, there were lots of games and toys for our little guy, very comfortable couch, and the view - WOW!!! The pictures just don't do it justice! I was a little hesitant to pick a property that didn't have many reviews, even though they were all positive, but I am so glad that we stayed here and we will certainly be back! The drive up to the cabin is quite steep in the neighborhood, but there is a nice driveway out front that is flat and allows you to easily pull in and out. The ladies at Ashe High Country Vacations were very nice and very quick to respond to any questions, great company to work with! Lots of trails to hike, and great places to eat in Boone!" 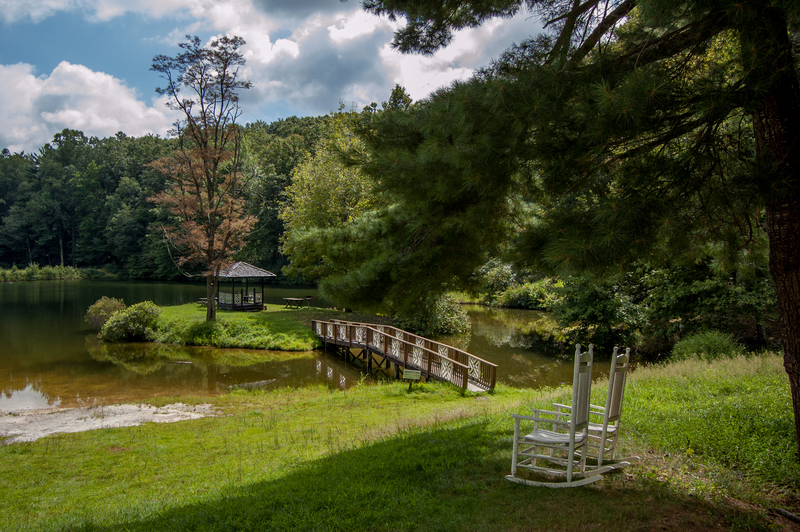 "My wife and I really enjoyed our stay at Ridgetop Retreat. 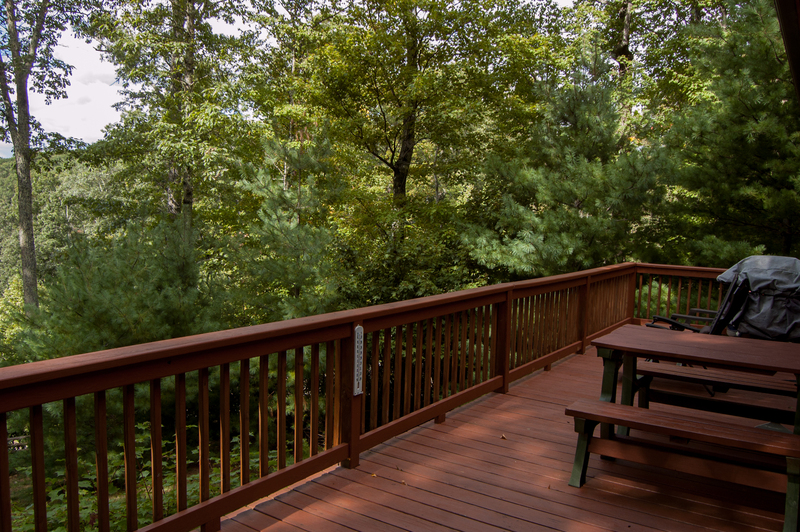 The deck and view are fabulous--our favorite part. We enjoyed going to Todd and renting bikes to ride on the Railroad Grade Rd. We hiked Jefferson Knob Summit trail and really enjoyed it. We cooked on the grill, ate out twice in West Jefferson. We liked our dinner at the Hotel Tavern best." "Beautiful view of the mtns and lovely morning sunshine plus an EPIC sunset. Close to Railroad Grade Rd (if you are a biker or kayaker) and all it offers. Not too far to a grocery store and a great Bakery in West Jefferson (Rosebud Bakery)." 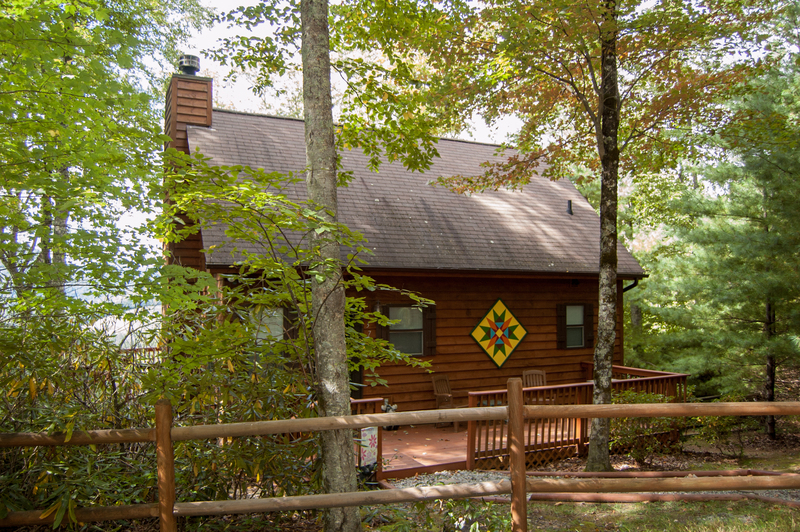 "To the owners: It is a fantastic cabin and we enjoyed every minute. Thank you for sharing! For other prospective renters: The cabin was like new, clean and fully equipped with everything we needed and all in good working condition! We loved the gas fireplace and the fabulous view from the living room, bedroom, and deck. Be advised that to get this great view you must drive up a mountain but the roads are paved. Also you will have close neighbors but they dont obstruct the view. The cabin has no washer/dryer so you may want to bring a few extra towels if youre staying long. " "Well, the pics don't do justice. Fantastic panoramic view with 5 major peaks in the distance. You will find no cleaner place and ZERO smells. Back deck is huge.Circle drive easy turn in and out. You will sleep like a baby on the memory foam mattresses. Plenty of books, movies and games for the kids. You are on TOP of the mountain facing North West. Shower has plenty of hot water. Peaceful. You can be in West Jefferson in 10 minutes. "